We had this video sent to us today, and thought we would share it with Aggie Nation. 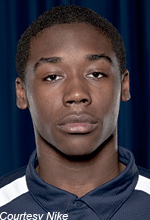 Rashard Figures is a 6’4″ 195lb shooting guard playing his high school ball at Hackensack High School in New Jersey. He’s currently a Junior (Class of 2014). Rashad who has offers from Utah State, Rhode Island, St. Joeseph’s, and Seton hall, is known for his long range shooting ability as well as his ability to slash and take the ball to the hoop. Other teams that have shown interest are UConn, Georgetown, USC, St. John’s, Virginia, Maryland, Iona, Depaul, Boston, and Rutgers. Check out Rashard’s ESPN Profile.